Having a car insurance policy has become vital and mandatory in India. As per the Motor Vehicles Act of India, it is mandatory for every car owner to insure his or her vehicle with at least a third-party liability cover. Having a car insurance protects the insured from unforeseen liabilities and unnecessary financial stress. There are basically two kinds of insurance policies available in the market, comprehensive insurance policies and third-party liability covers. A Comprehensive insurance policy covers third-party liabilities as well as own damage liabilities while a third-party liability car insurance plan covers third-party liabilities alone. Due to the technological advancements taking place in the insurance sector, you can purchase or renew your car insurance policies online as well by visiting any of the official insurance websites or third-party insurance websites. You can directly approach the insurer via an official website and purchase or renew your car insurance policy without any unwanted interference from third-party insurance agents or middlemen. This saves you from being cheated and also helps you save money in terms of travel, documentation, etc. When you buy or renew insurance online, you are eligible for a number of discounts offered by the insurers. This is another way of saving money on your car insurance. These discounts are exclusively for policies that are purchased online, therefore making purchase or renewal of car insurance policies inexpensive. Online purchase or renewal of insurance policy saves time for the insurer as well as the insured. The documentation necessary for online purchase of insurance policy is less or close to nil. Buying or renewing insurance policy online is hassle-free and easy. The insurance websites have an in-built tool for instantly calculating and quoting an estimate of your insurance premium. This tool is called premium calculator. This makes the whole process of online purchase/renewal of the insurance policy and decision making easier for the policyholder. You can save on your car insurance policy purchased online compared to the insurance policy purchased offline. Identity theft and other phishing sites have become a big concern when it comes to online purchase/renewal of car insurance policies. But this too is being taken care of by implementing safety measures such as security checks, information filtering, data protection tools, etc. 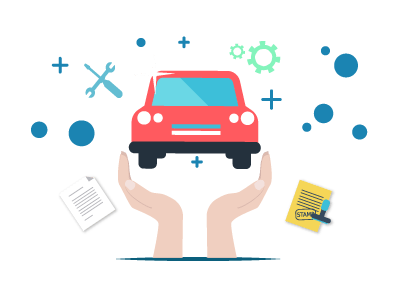 Buying a car insurance policy offline from the insurer itself or via insurance intermediaries is an old school method of availing an insurance policy. Offline purchase or renewal of car insurance policies is still favoured by many in India. Offline purchase/renewal of the insurance policy is secure. The added knowledge and expertise of the insurance agent can offer/suggest a good coverage for you based on your insurance needs. The insurance agent or employee will fill in the forms for you and complete your documentation. The only thing that you will have to fill in is your signature. This makes the whole offline process easy and hassle-free for you. You won’t have to do the documentation on your own at all, saving your time and energy.